Perfect for home offices and studios of all kinds, and also as a tiny house. Ideal beginner’s project. This studio is one of the simplest, most practical of my designs. Multiple units can be connected if you want to add on later or they can be built as free standing structures in clusters pavilion style. Numerous roof options available. 177 sq. 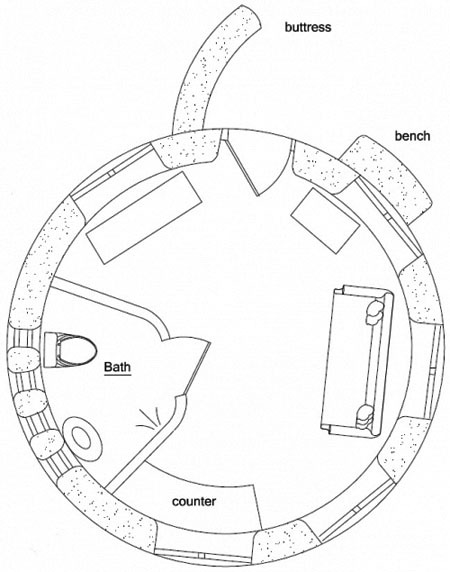 ft. interior, fold-out bed, 1 bath: footprint: 18′ diameter, plus buttress. Hi, Owen. Love reading through the website and think I’ve finally found a good design (Roundhouse Studio) for my ‘eco-village’ set up in Ghana. I want the structures to fit in well with the traditional construction methods, but last longer than they typically do and this style is perfect. I would like each hut to be an efficiency studio apartment. I recognize that the plans do not include details on electrical or plumbing, but is there at least guidance on when that aspect should be included in the building process? The last thing I would want to get is get to Step #8, only to realize I should’ve been planning on those things from Step #4. I’m fairly experienced with construction, even in the local style here in Ghana, but have 0 skills with electrical and plumbing, so I would have to consult the local artisans who would be unfamiliar with earthbag building. Lastly, is there directions on how to fortify the structure for the bathroom? Is there waterproofing that needs to be done with the walls and, if so, is there guidance on that included in the plans? The plans are simple and basic with just essential info. The book that comes with the plans covers electrical and plumbing. These things are done nearly the same as in any other house. The differences are shown in the book. You’ll be fine if you study the book and watch my free step by step videos on YouTube or get my DVD. Tip: Consider making the studio about 2′ larger in diameter. I think that would be more comfortable and practical. And/or you could attach the bathroom on the side of the building. This takes more materials but again it adds more space inside. Earthbag is getting quite popular in Africa, especially Malawi. Good advice on the sizing. I want to build a few of these on a quarter acre plot, but size is one of my least restricting options. I’ll check out all those resources, too. I can’t use PayPal, so trying to figure out another way to get the PDF book. I could have my bank mail a check to the woman (?) who is in charge of it. Is she based in the US? I have seen a few tire structures here in Ghana, but more in the southern part of the country. I’m more confident in my local northern artisan’s ability to work with these bags as they’re closer to the standard mud/clay blocks and the dirt is readily available/cheap in comparison to even used tires here (which I would still have to fill with dirt). Have yet to see any earthbag structures here firsthand, but have heard rumblings of a few places that some NGOs worked with. I’d like to use cob-style architecture inside the hut, building a few of the furniture pieces, like a platform for a couch and chair, a few end tables, TV stand and the bar/kitchen-living room divider. I’m exploring options for the roof now and would gladly take any advice. 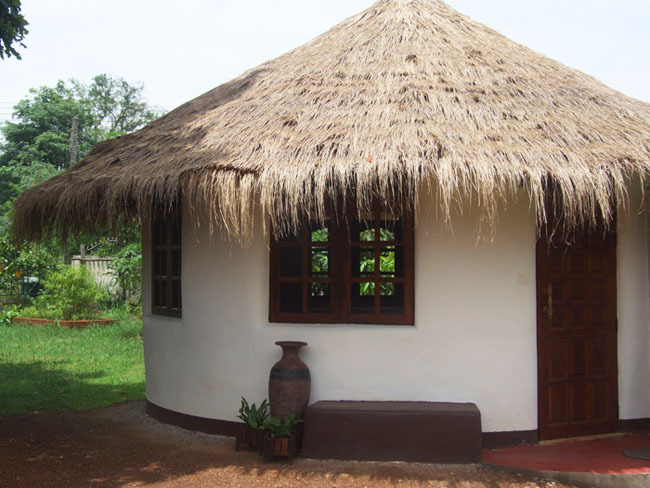 Thatch is the standard for local architecture, but it limits my rainwater harvesting capacity. I love the idea of a flat, clay roof/sleeping (or drinking!) platform on the hot nights, but I’m in this weird transitional zone in Ghana where we still get torrential rains, followed by prolonged periods of baking hot heat. I’m not sure how well that roof will hold up. As the Sahara creeps further south, I imagine those weather patterns to intensify. However, I thought these flat roofs (which are used about 150km north of here as a standard building style) might also enable me to set up some rainwater harvesting systems on site. The city that we’re on the outskirts of is slowly creeping northward toward the airport, but modern conveniences like sewage and drainage systems, water pipes and electricity aren’t here yet and won’t be for another few years. I’m trying to think ahead, as well as realistically given the environment (i.e. frequent power outages, water cuts, etc.). The other option is aluminium sheets, but having lived in a mud house during Peace Corps with one of those types of roofs, it just makes the whole house a bit like an oven. I want to minimize my energy footprint as much as possible. Having the bathroom attached to the outside of the house would also reduce moisture within the home, too, right? My biggest concern with these earth bags is having moisture/mold build up within the house. 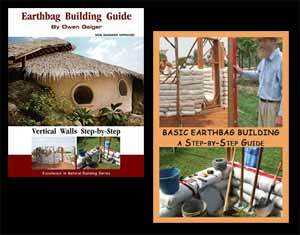 Many earthbag houses are in tropical regions without problems. Just don’t use materials that mold such as carpet, wallpaper, etc. Contact Zafra. She will explain everything about ordering the book or DVD or even a house plan if you want. Keep researching your options and studying local buildings to learn what works best. You’ll eventually sort it out. Love and follow all your blogs.yes naive little round house. Why not have toilet in a separate little covered space? Lots of options — add adjoining shower on the outside (requires building another door and extra roof) or build a separate structure. Our goal was to keep it simple and low cost. Yes, it’s simple enough to be included. Maybe Owen will say differently, but from what I have seen on YouTube channels, the basic structure and roof frame could be put up in less than a week with people putting in solid hours. The plastering and flooring and all that would take several more days, depending on the materials you use (slow drying if you want to do a sandcrete floor, for instance. There’s a YouTube channel that I really like called My Little Homestead. They have numerous different designs on their property and general work in a team of 4-5 people (4 kids + 2 parents) on whatever project they’re putting up. Of course, they’re basically pros by now, but as long as you go into it with good plans and at least 1 or 2 people that know what they’re doing/are well-versed with those plans, with 10 people, it really shouldn’t take that long. Yes, that’s possible. My Little Homestead channel shows exactly how it can be done. They’ve been careful not to take on giant projects. They do one smallish project at a time and now they have a good number of buildings finished.